Two brothers(兄弟) from central China's Henan Province moved(搬到) out west to a desert(沙漠) area(地区) in Xinjiang, bringing(带) with them red date(红枣) trees(树) from their hometown area, hoping to popularize the fruit. 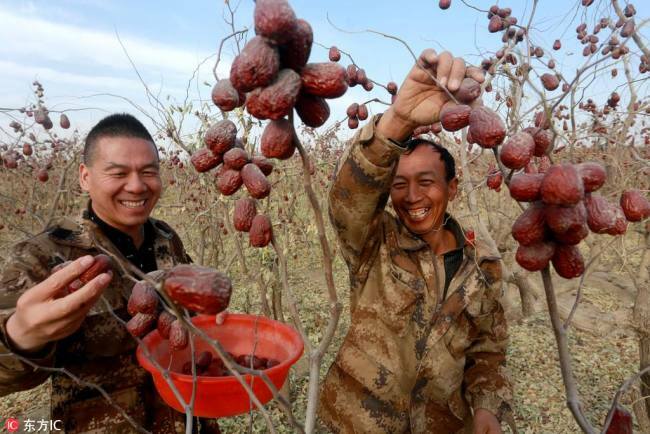 Hundreds of miles from their homes, the brothers Zhang Guoxiang(张国祥) and Zhang Jianjun(张建军) have spent 10 years trying to cultivate(培育) these dates near(靠近) a desert. Now, they have more than 1,300 hectares of red date trees thriving in the arid desert conditions. By introducing the red date trees to the area, it helps in staving off desertification. Further(此外), they are creating(创造) jobs(工作) which help reduce(减少) poverty(贫困) in the area. Now, they sell(卖) the dates online(网上) which has also greatly improved their business. E.g. Nǐ yǒu xiōngdì jiěmèi ma?